I've just returned from Indonesian New Guinea where I stayed at one of the few remaining hotels in Manokwari after the January earthquake. A warning system saved all lives except that of a little girl who was killed by a falling wall. Moses was in Hungku and said the twenty minute shake made them sick and dizzy, but reports no damage. We held project meetings at the Mansinam Beach Resort now maintained by several familiar faces from the ruined Hotel Mutiara. Present were engineer, Martin Watofa, Susan Mores, team manager in Manokwari, Chief Moses Saiba, his brother August and three of his sons, Seth, Oni, and Seblum. Professional guide Yoris Wanggai translated. We have collected twenty five percent of the money needed for the project and it is held in a bank account belonging to Moses Saiba(at a good interest rate I understand). The tribe is discouraged as the mining companies are approaching and the environment will be ruined by mining waste. Why save Hungku when there will be no nature? Yoris and I agree we must make the tribe str0ng and fight the pollution along the way. Martin is in charge of engineering the project and reluctant to buy materials until we have fifty percent of the money(another five thousand). Purchased cement may get damp and ruined. We have decided to order pipe from Surabaya, Java immediately as it will not spoil, sea freight is slow and the price is rising. The tribe needed encouragement so I purchased a brass faucet at a local hardware store and gave it to them. They passed it around turning it on and off with wonder and renewed faith. Moses has made a wonderful colored map( 20 inches by 34 inches) of Mt. Hungku, the boundaries of the village, the bowers, rivers, and gardens which I will have copied and use for promotion. He was pleased to announce that the Harpy Eagle still resides atop Mt. Hungku, that there are new Bower Bird and Bird of Paradise babies(chicks) and that he has discovered a cave inhabited by fruit bats. He gave me a red and old crocheted bag made by his daughter for her grandfather "Isak Ahoren". It gave me and idea for a way to involve the tribal women in this Project. Materials were purchased and bags will be made for large donors(five hundred dollars or more) integrating their name. The first will go to Kim Harbin our largest donor. The second will be for New York artist Hunt Slonem. I met a team of scientists studying the impact of mines on the environment. They invited me to speak at the University of Papua in Manokwari in late September. The Bower Bird paintings have been transfered to the Dowling and Walsh Gallery in Rockland, Maine(http://www.dowlingwalsh.com/) for a show in September. There is a benefit planned for late summer for the Hungku Water Project in Sag Harbor, New York. 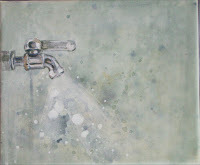 These paintings were inspired by Sougb expressions as they fingered the single water spicket. "what will the first water look like?" Please send money if you can. We will get there one drop at a time.